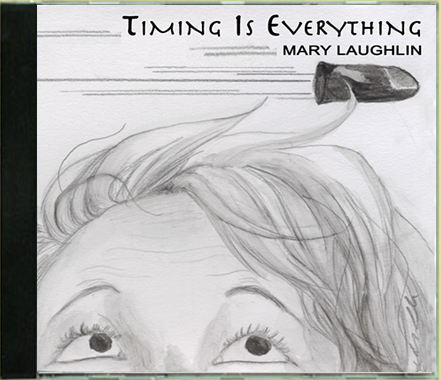 Timing Is Everything is an album of original blues written and performed by Mary Laughlin from Richfield, MN. Timing Is Everything is everything you want in a blues album. Tracks include Timing Is Everything, Bad Situation Blues, Fade Into One, Pieces of the Past, What You Give Up, Never One Woman, Love You, Hate You, My Addiction, Mocha Song and Church of the Soul. Accompanying Mary on the album are John Fitzgerald (drums), Steve Wigen (guitar), and Emily Laughlin (ukelele on Church of the Soul). Mary plays the piano and harmonica on the album. Timing Is Everything was recorded at Custom Recording Studio, Minneapolis, MN., and mastered by Stu Nankin, Worldwide Music Network, Maple Grove MN.